The L.C. Miller Company designs and manufactures automated, high production computer-controlled systems, called The RoboThermT Series. 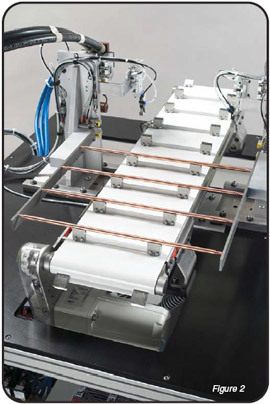 The RoboThermT systems utilize the induction heating processes that braze and thermally treat a multitude of industrial products. These systems provide improved safety, increased productivity and reproducible quality that is not possible by conventional methods. Our computer technology allows you to process parts of various dimensions and configurations at the lowest possible cost. 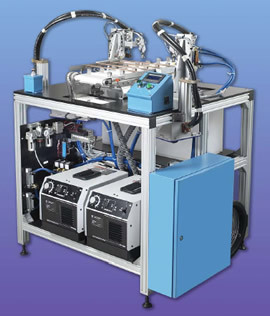 The RoboThermT can be designed to process parts in air, vacuum or controlled gas environments. Safety hazards to operators and others in the area because of an open flame. Flame annealing of the ends was inconsistent; the degree of annealing varied widely, resulting in a very high level of rejects. Annealing in air resulted in oxidation which could not be tolerated because of high electrical contact resistance. To remedy this condition, the oxide was removed with wire brushes which created another problem of air-borne micro-particles of copper oxides. The cost for capital equipment to eliminate these hazardous conditions were enormous. This necessitated an entirely different approach which initiated the concept of the RoboTherm™ systems. The converyorized portion of this system (Figure 2) where the copper rods are transported and indexed into a position where they are picked up by two programmed tweezers. At this time two small quartz chambers, purged with low-pressure nonoxidzing inert gas, flows over the ends of the rods while radio frequency energy uniformly heats the ends to the annealing temperature. Immediately after heating, a small volume of pressurized water quickly cools the ends. This is followed by a short blast of air that clears the chamber of residual water. The gas filled quartz chambers now slide out of the way, the tweezers remove the annealed rod and places it back on the conveyor and then picks up the next rod to be annealed. The annealing and cooling process takes about 12 seconds and the parts emerge completely dry, bright and oxide free. This system completely eliminated all of the hazards and time consuming operations of the previous method. This narrative description of the computerized operation of this system illustrates its complexity and demonstrates our ability to resolve complex designs involving safety, ergonomic and environmental issues in the most cost-effective manner. Annealing copper contacts and connectors. Annealing and hardening saw blades. Annealing automotive air bag switches. Brazing medical and veterinary tools. Epoxy curing sports equipment, golf clubs, etc. This list only shows a small fraction of possible applications that could utilize the RoboThermT technology. If you have a particular production need, send or call-in your requirements by e-mail or call toll-free to 800-899-3611. A sample of the part, together with a drawing would be desirable. Our laboratory staff will analyze your requirements and quickly respond with our written recommendations.